Entering Machrihanish village. Machrihanish, home of the famous Machrihanish Golf Club and one of the most idyllic parts of the Kintyre peninsula. With it's spectacular panoramic views out over the Atlantic Ocean there are few more beautiful sunsets to be seen anywhere in the world. The picture to the left shows the view as you enter the village from Campbeltown. 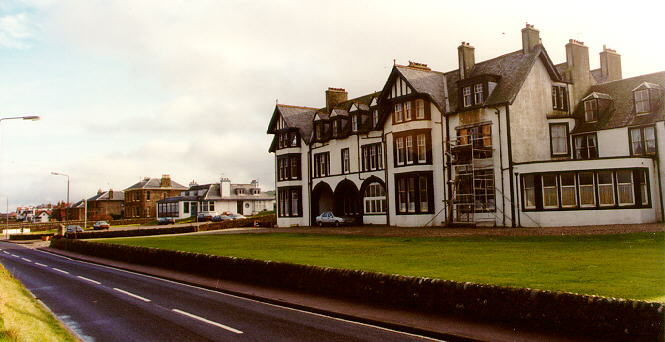 There are very few houses built on the shore side but these impressive traditional buildings on the landward side are a reflection of the grandure that once was Machrihanish. A number of these houses now provide varying levels of tourist accomodation. Machrihanish can be easily split into two sections. Halfway through the village there's a turn in the road and at this turn lies a rocky outcrop from which this picture was taken. In the top right corner you can see the road back to Campbeltown, and directly in front where the golfers are congregated, the first tee of the Machrihanish Golf Club. The first hole runs alongside the beach towards the left of the picture. The small white hut to the golfers left is the professional's shop. If you wish to contact the club to book a round you can call them on +44 (0)1586 810213 (and don't forget to tell them you found it on Johnny MacKinnons WWW page)! Turning through 180 degrees from the previous picture gives us this view - the other half of Machrihanish. The road ultimately comes to a dead end, although if you follow the coast line round past the Stirling University Marine research centre you come to the Pans, so named because it used to be a centre of salt production by evaporation of sea water. This was also the site of the first successful transatlantic radio transmission achieved by Reginald Fessenden in January 1906. In the picture the second building on the left is the village shop, formerly the village hall and just past it is the road which leads up to the council houses. Shown in this picture is the building which was once the Ugadale Arms Hotel. This picture has been added especially for one particular entrant on the Dalintober Midges page who used to own and run this very hotel. Once a grand and splendid traditional hotel in every sense of the word it was converted into holiday flats, previously home to the Americans who used to populate the Air Base prior to its closure in 1995. To the left of the hotel is a better view of the Club House. 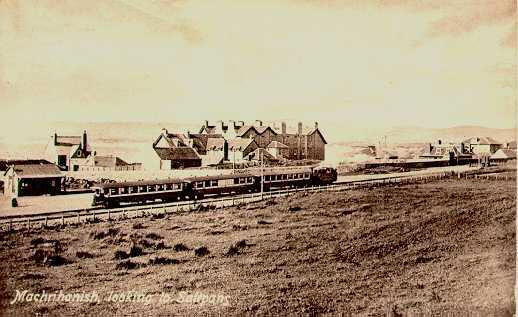 The picture shown on the left depicts the Campbeltown & Machrihanish Light Railway passing through the village. The railway required a special act of parliament as it ran on a non-standard gauge size of 2 feet 3 inches. It was originally put in place in 1877 to facilitate the transportation of coal from the mine to Campbeltown but in 1906 was adapted for regular passenger traffic as shown in the picture. However by 1931 the temporary closure of the pit and the general depression proved too much for the railway company which closed the line and sold off the rolling stock for scrap.